My Hostel Ella i Ella, Sri Lanka: Reservér nu! Ella is one of most fabulous places located in Uva Province in the tropical island Sri Lanka.It is a natural paradise around the location and it has a rather freak, hippie vibe and has some of the best eateries in the island. 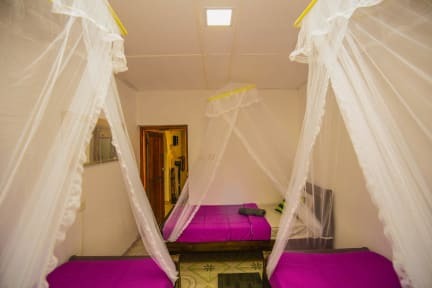 MY HOSTEL is one of the calm and quiet places that are not to be missed as your destination place to stay while your journey in paradise Ella. This heart touching place has located 1 km away from Ella and you can reach the place within few minutes without any disturbances. My hostel provides modern, comfortable, safe and clean accommodation with all modern amenities. All your backpacker-needs are covered: from a safe, accessible location, rooms with comfortable beds and separate bathrooms, hot water shower and fresh interior, free WI-FI with friendly personnel who often ready to serve you with the familiar atmosphere. You can get a fantastic experience with your first presence in MY HOSTEL and do not miss to share the great experience with us. 5. Breakfast is served between 08.00 AM – 10.00 AM. If you need to prepare the b-fast before 8.00 AM make early announcement for the crew members. 8. All type of drugs is forbidden inside the hostel as well as not allows smoking inside the rooms. 9. We operate a strict one person per bed policy and we are charging for extra people you fetch in. 10. If there any good or bad comments during your staying you can directly express before you check out.